Rheumatoid arthritis (RA) is a form of arthritis that causes pain, swelling, stiffness and loss of function in your joints. It can affect any joint but is common in the wrist and fingers. More women than men get rheumatoid arthritis. It often starts in middle age and is most common in older people. But children and young adults can also get it. You might have the disease for only a short time, or symptoms might come and go. The severe form can last a lifetime. Rheumatoid arthritis is different from osteoarthritis, the common arthritis that often comes with older age. RA can affect body parts besides joints, such as your eyes, mouth and lungs. 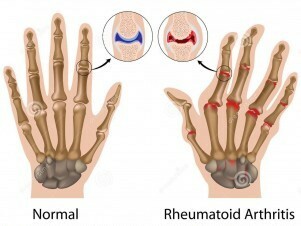 RA is an autoimmune disease, which means the arthritis results from your immune system attacking your body’s own tissues. No one knows what causes rheumatoid arthritis. Genes, environment and hormones might contribute. Treatments include medicine, lifestyle changes and surgery. These can slow or stop joint damage and reduce pain and swelling. How can Stem Cells Help Rheumatoid Arthritis? Currently, RA is treated with immune suppressive agents such as steroids, methothrexate, cyclosporine, gold, and more recently infliximab (Remicade). Despite inducing temporary improvement, these approaches possess long-term adverse effects due to non-specific inhibition of immune responses. Additionally, current treatments do not address the issue of damage that has already occurred to the joints or extra-articular tissues. Because Rheumatoid Arthritis complications include inflammation and tissue damage adult stem cells may target inflamed areas of the body and produce anti-inflammatory agents. Stem cells have the ability to produce Regulatory T cells, a type of immune cell whose responsibility is to regulate the immune system while maintaining tolerance to self-antigens. By differentiating into these types of healthy cells there is a possibility that adult mesenchymal cells will be able to address the complications caused by Rheumatoid Arthritis. Which Kinds of cells are used in Rheumatoid Arthritis and how are they obtained? Adult Stem Cells are obtained from ITC Bank from donor tissue or Autologous Transplant is harvested from the patient own Adipose Tissue and it takes 21 days to culture, differentiate and administered the Adult Stem Cells to the patient. How are Mesenchymal Stem Cells (MSC) administered in Rheumatoid Arthritis? A Typical treatment is as following and are administered by a license physician. Will anyone follow up with me after I returned home? Del Prado Stem Cell Center cares about how you are doing after you return home. So, we will monitor your progress on a regular basis. Regular follow-up also helps us evaluate the effectiveness of our clinical protocols and improve them based on observed outcomes. Therefore, our medical staff will be contacting you after 1 month, 3 months, 4 months, and 1 year to follow up on your condition. Feel free to contact us we will be more than glad to assist you.